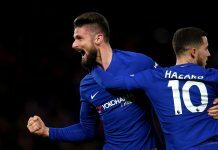 Chelsea survived a huge scare as they defeated a spirited Hull City 3-2, after going 2-0 up in the opening ten minutes. 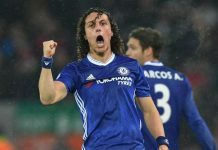 Jose Mourinho made two changes to the side who drew last Sunday with Southampton, with Filipe Luis replacing Cesar Azpilicueta at left back, and Ramires in for fellow Brazil midfielder Oscar. Gary Cahill and John Terry celebrated club milestones today, with Cahill playing his 150th game for the Blues, and captain Terry playing in his 450th Premier League game. Tigers boss Steve Bruce also made a pair of changes from their last game at Leicester, seeing David Meyler come in for the suspended Tom Huddlestone, and club-record signing Abel Hernandez replacing Nikica Jelavic, who is out injured following knee surgery. Highly rated England Under-19 midfielder Ruben Loftus-Cheek, who Mourinho openly said will be challenging for a first team spot next season in his press conference before the game, was rewarded with a spot on the bench following another string of accomplished performances for our age-level sides and impressing in first-team training. It was an absolute dream start for Chelsea, as the first action of note lead to a sublime goal from Eden Hazard to put the travelling Blues ahead. After picking up the ball just outside the area, the mercurial Belgian blasted home for 1-0. You would have been forgiven to expect the home side to collapse following that early goal but in fact quite the opposite occurred. Only a great point-blank save from Thibaut Courtois denied Abel Hernandez from levelling almost immediately as the game started at a furious pace. Inside 10 minutes Chelsea had doubled their advantage in what was an enthralling start to the game. Diego Costa found himself out wide and punished Michael Dawson’s inability to pressurise him by curling in from an improbable angle as Chelsea came flying out the blocks. However credit must be given to how the home side responded after going 2-0 down. Facing the league leaders and going 2-0 down after 10 minutes many would imagine a cricket score would follow, but Hull dug deep and responded in great fashion, carving out opportunities for Hernandez and Gaston Ramirez. They finally got their goal after 21 minutes gone, as Branislav Ivanovic was left for dust by wing-back Andrew Robertson, who then supplied an inch-perfect ball for his fellow defender Ahmed Elmohammady to tap in from close range. Not more than 80 seconds had passed before Hull found themselves improbably level. A collector’s item ensued as a weak backpass from Ivanovic left Courtois in trouble, who thought about clearing it but instead with a heavy touch gifted it to Abel Hernandez to tap in for his first goal for 5 months. As the half time whistle blew it was a situation all too familiar for Chelsea fans as another leading position was squandered – only our win at Aston Villa did us losing a lead did not cost us the result in 2015. Following our result last weekend, there must have been scores of Chelsea fans thinking our league win was not as academic as first thought as the teams trudged off. Chelsea bounced back well at the start of the second period as chances fell to Diego Costa and Cesc Fabregas but neither could convert. The zip to their play that had partially deserted them towards the end of the first half had re-appeared, but could not make it count as Hull weathered the storm. Much like the first half, the Tigers were impressive in their approach once they saw out the spell of Chelsea pressure – playing with a desire that matched their precarious position in the league and a verve that belied it, for good spells they were the team on top. So much so, it took a phenomenal hat-trick of saves from Courtois to keep the scores level. Elmohammady should have made it 3-2 was it not for a smart block, the follow up by Jake Livermore was palmed away and finally a Gaston Ramirez volley was tipped over the bar. The pace had begun to slow down as the teams regrouped in an effort to find a winner, but still the match remained evenly poised as both sides had various half chances, but not enough to really warrant a winner as the final 15 minutes loomed. Chelsea introduced Loic Remy for Diego Costa as our search for supremacy continued. And what a change it proved to be. Slick movement down our right saw Willian square it for the Frenchman, whose effort trickled past Allan McGregor just 92 seconds after his introduction. More changes occurred, as Chelsea looked to see out the game with Kurt Zouma replacing Willian, while Hull made all three substitutions in one go as they pushed for an equaliser – Robbie Brady, Sone Aluko and Stephen Quinn coming on for Ramirez, David Meyler and Andy Robertson – the latter off to a standing ovation following a great shift from the young Scottish full-back. And push on they did as chances came for N’Doye and Hernandez but to no avail – they proved to be the final chances of a pulsating encounter as we held on to extend our lead at the summit of the table to six points with a game in hand. Our next game is at home to Stoke City in the Premier League, on the 4th of April.